A most delectable way to spend the long weekend – cheese making workshops July 30 & 31st! Photo courtesy of Meighan on Flickr. Another ROUND of Cheese. We hope you’re ready for some more cheese filled fun, as David’s back in the city with 3 beginner classes and one advanced workshop to choose from! First Farm Market of 2011, June 25! Practicum students toting the last greens to the Harvest Hut on the eve of our first Farm Market! AGRO Cafe owner Blake Hanacek, a UBC alumnus, discusses beans with a customer. Their scrumptious baked goods even included vegan options! Edible nasturtium flowers add amazing flavour and visual appeal to salads, and they’re also great garnishes for desserts. Join instructor Alaina Thébault from the Environmental Youth Alliance for a special Saturday morning yoga class at the UBC Farm. The two places Alaina feels most alive is on her yoga mat and outdoors. A budding green thumb and an avid yoga instructor, she designed this class for gardeners and yogis, at any stage of either path. Yoga, like gardening, is at its roots an ongoing practice. As gardeners we plant a seed and watch it grow, tending, nourishing and protecting it, welcoming the fruits of our labour. For a student of yoga, the seed is the breath that we witness as it nourishes and connects us to our body, mind and soul; the fruits are the peace and strength we ultimately achieve. 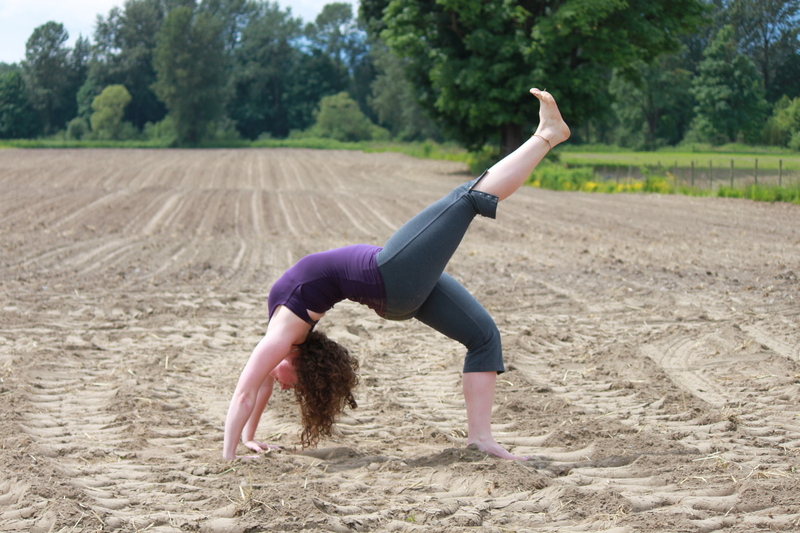 Alaina teaches various styles of yoga throughout Greater Vancouver, including a weekly Yoga for Gardeners class at the Strathcona Community Garden’s Eco Pavilion on Hawks and Prior. Classes are by donation and take place every Monday night from 7:00-8:30pm until August 29th.